It is not true that only 5 percent of smokers get lung cancer. 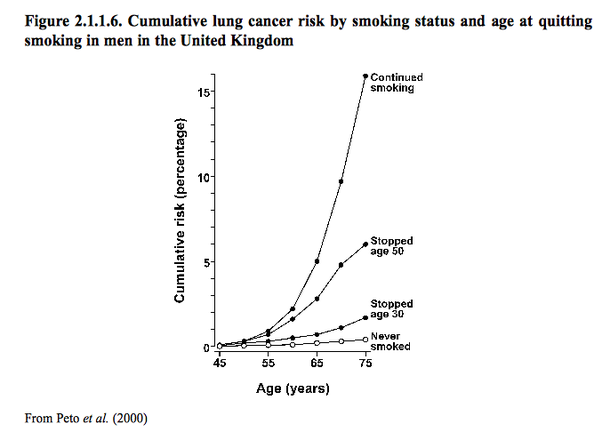 Source: IARC Monographs on the Evaluation of Carcinogenic Risks to Humans (http://monographs.iarc.fr/ENG/Mo…) Volume 83 (2004), Tobacco Smoke and Involuntary Smoking (specifically p. 167 in Chapter 2; there are also many other interesting charts on pp. 162-175, and useful tables from p. 177-263. If a smoker quits by age fifty, then they still have a lifetime risk of over 5% of lung cancer alone. Someone who continues smoking past that age has a much higher chance of lung cancer (up to 15% plus). On top of that, of course, smoking increases the risk of many other kinds of cancer besides lung cancer, though not quite as much; so you’d probably multiply these risks by another 50% or so to account for the increased risk of bladder cancer, kidney cancer, esophagus cancer, etc. So let’s say maybe 7-8% chance of smoking-related cancers for our hypothetical smoker who quit at 50, and maybe 20-25% for someone who smoked through his 70s. And that’s all on the background of non-smoking-related cancers. Posted in Cancer, Quora | Comments Off on Is it true that only 5 percent of smokers get lung cancer?